What’s the perfect wedding gift for your little sister? The one who’s been married twice and waited 10 years before she decided she was ready to take the plunge again? I’ve been pondering this question for weeks and time is running out, the wedding is this Saturday. It will take place in my back yard, ahem, tiny little garden. Wedding day minus 5: Bride and groom arrive at the airport. Bride and I are so excited to see each other we walk into the men’s washroom and don’t realize our mistake until we spot that man by the urinal! Bride is happy that the wedding preparations are well in hand. Groom has a horrendous ear infection and is verging on comatose. Wedding day minus 4: Bride and Groom visit the Registry office and pick up a marriage license. The clerk makes them promise not to spindle, fold or mutilate the license which he then shreds in the printer. We stand in the back yard, ahem, my little garden, squinting at the sun trying to figure out how it will angle over the eaves so that we can settle on the perfect placement of the bride and groom. We haven’t quite figured out how to pack 25 guests on to our tiny patio but are convinced it can be done. Wedding day minus 3: Groom cracks and we take him to the walk-in clinic—for his ears, not nerves. He receives treatment, antibiotics and ear drops and is slowly recovering. We go to the airport to pick up Mom and Dad. They’re 84 and I am amazed yet again at how tiny and frail they look. Our plan to rent a vehicle at the airport in order to pick up another sister and her children an hour later falls apart because there are absolutely no cars to rent other than the SUV for $199/day! We take the folks home in a town car and leave the men with the family car to wait for my sister and her kids. By now every spare bedroom is packed with relatives, everyone is talking at the same time, the children are laughing and the dog is exhausted from trying to keep an eye on us all. The big question preoccupying us all is what to throw at the bride and groom after they’re wed—confetti? No, it’s impossible to get out of the lawn, even with a shopvac. Rice? Doesn’t it expand in birds’ stomachs and make them explode? If not rice, what about rice crispy squares—OK now you’re being silly. Wedding day minus 2: For some reason the soles of my father’s dress shoes fall apart and we’re off to the mall to buy extra wide shoes. (My mother’s slippers also disintegrate—I have no idea why). The skies opened that evening and hail stones pelt the back yard (ahem, garden) pulverizing the annuals. The Groom’s two sisters and their families arrive and check into a nearby hotel. Groom is on car duty picking up and dropping off assorted relatives. Groom is a very patient man. Wedding day minus 1: My husband announces he’s put out his back hauling the Party Time china, cutlery and stemware into the house. Luckily the Groom is fine. Dad got stuck in the soaker tub—at 84 it’s a bit tricky hauling yourself out of there I guess. I take the parents, one sister and her kids and my daughter to the Zoo (the real one, not our household) to get us out from underfoot while my husband and the Bride prepare the rehearsal dinner. Not a moment too soon either as Dad is instructing my husband on how to make jamabalaya (this from the man who just recently figured out how to fry an egg). The Zoo is delightful, but we lose Dad temporarily when he stops to take off his sweater and is swallowed up by the crowd. Meanwhile the Groom makes yet another trip to the airport to pick up more nephews and girl friends. Exhausted from the Zoo, we return to the madhouse. Wedding day: We set up the banquet table which spans the dining room and the living room. I send everyone to the mall while I set out the Party Time china, stemware, cutlery and linens—everything looks terrific. My husband and I pick up the Crave cupcake/wedding cake. It’s gorgeous but huge. A quiet calm descends upon the house as we all sneak off into our own little corners to get ready. Finally the guests arrive, the Marriage Commissionaire is ready and we begin. The Groom surprises everyone by getting down on one knee to propose “properly” to the Bride. The women daub their eyes and the men are speechless at the sight of such gallantry. The garden is warm and sunny, the old folks are sitting in chairs, the young ones are standing on the grass and everything goes off perfectly. After the ceremony, everyone mills about getting acquainted. I make a last minute check of the dining room and discover to my horror that the little bride and groom who were perched on top of the wedding cake have slid off…the brides’ head is resting on a ledge behind the sideboard, the little groom is clutching a headless torso but is none the worse for wear (well except for his thumbs which have also disappeared). Oh my god! How do we tell the bride? My youngest daughter whips into action. She has a glue gun at home and speeds off to her apartment to get it. Meanwhile the Bride, blissfully unaware of the drama playing out in the next room, puts her arm around me and tells me that “everything is perfect, absolutely perfect!” I have to tell her…so I gently lead her into the dining room to show her the carnage, and she bursts out laughing. 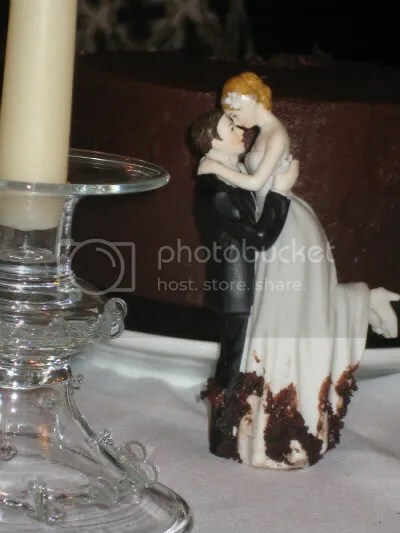 Soon my daughter is back, glue gun in hand and the little bride is back where she belongs, in the arms of the little groom who is up to his knees in chocolate icing. The wedding dinner is perfect, the after party in the garden is perfect and by midnight everyone is unconscious in bed. So what’s the perfect wedding gift? It’s something that I don’t have the power to give—it’s the gift of health. In that tiny garden I counted 1 stroke, 2 cases of cancer, 1 pnemonia, 4 wonky gallbladders, 1 pancreatic cyst, 4 high blood pressures, 2 rheumatoid and 1 osteoarthritis plus innumerable minor ailments. And that’s just on our side of the family. As I watched the Bride speak her vows in a strong clear voice I realized that the only reason that my sister was here at all was because she had a wonderful doctor who recognized a potentially fatal disease and aggressively pushed her through the system before the illness could take her from us. The “gift” of good health is an incredible thing. It springs from a combination of genetics and environmental influences. It can vapourize over night if the government lacks the wisdom to manage its resources prudently and share them with all of the people fairly—not just those who can afford it. My gift to my sister is my commitment to continue to fight for good healthcare for all of us. Wedding day plus 1: Everyone is heading home. My parents are exhausted, but held up very well considering their age. The sisters, their spouses, nieces, nephews, girlfriends and boyfriends have left or planning their escape. We’re reclaiming the nooks and crannies of our home and poring over the wedding photographs. It was all perfect! This entry was posted in General Health Care, Uncategorized. Bookmark the permalink. As the blushing bride I must confess I have not had much luck in love, or in life, but I got very lucky over 34 years ago when a very nice woman I worked with gave me the name of her general practitioner when I was looking for a doctor. So, here’s my question. The government, and the medical systems, have had 34 years to practice on me; education has excelled, technology, medical knowledge and break throughs have pushed forward at great speeds, so why are we back where I was 34 years ago. People are still looking for family doctors and unless they get lucky, like I did, and find a very knowledgeable dedicated doctor their lives are at risk. With all that is avaiable today no one’s life should ever be at risk because they don’t know where to turn. Oh yes, one last thing. Thank you Dr. F. Allan Watts and, my sister, Susan for fighting the good fight. It took me a long time to find the person who would be with me when I was 84 and thanks to your efforts and dedication I am still here. Rose Marie, as you point out, you were one of the fortunate ones who found a dedicated family doctor who went the extra mile for you when you needed it. Here in Alberta people are still trying to find a family doctor. This situation doesn’t look like it will improve any time soon, especially with our growing population and the chronic shortage of GP’s entering the system. It took my friend’s son 2 months in medical school to figure out that the last thing he wants to be is a GP. But we continue to fight on. Thank you for sharing your story. There’s just one thing I’d like to add–everyone who knows you is inspired by the way you’ve fought your way through these health issues. You showed tremendous courage and a delightful sense of humour. Nicely done, little sister. What a lovely post. It is especially poignant to read this today, the day we have lost the wonderful, and honorable Jack Layton. Would that we had been able to give him the gift of health. I wish your newly married sister every happiness, and all of your family the gift of health. Sheila, on behalf of Rose Marie, her new husband Jim and the rest of my family I’d like to thank you for your kind wishes. How sad that we’ve lost Jack Layton. He believed that a politician’s job was to work hard to improve the lives of Canadians. I do hope that his Alberta counterparts will learn from his example. Just to clarify…my reference to Jack Layton’s Alberta counterparts was not meant to be a criticism of the provincial NDP MLA’s. Both Brian Mason and Rachel Notley are working very hard to protect public healthcare. It was intended as a reference to those Alberta PCs who appear to be more concerned about protecting the interests of big business, be it private healthcare or the energy industry, than the interests of the Albertans.